In August 2014, I wrote an essay about the fact that The Vegan Society in the U.K. had become “corporate partners” with a bank that invested in “sustainable” animal agriculture. Now I write about The Vegan Society joining a campaign being led by a group that promotes vivisection. The Vegan Society prides itself on being an evidence-based organisation with an active Research Advisory Committee. Our policy work is guided by accurate information based on the latest scientific evidence and research. We have many values in common with Sense About Science and are therefore proud to be part of their Ask for Evidence campaign. Can you please tell me your position on the use of animals in experiments? Please do let me know if you have any further questions about our work. 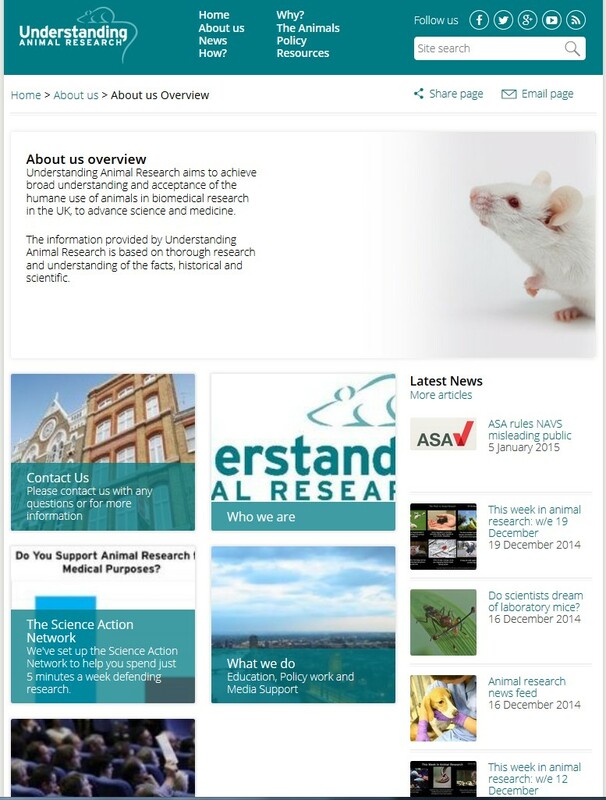 Understanding Animal Research was founded at the end of 2008 by bringing together two UK organisations, Research Defence Society and Coalition for Medical Progress. It is a membership organisation with over 110 member organisations and many more individual supporters. Organisational members are drawn from various sectors including academic, pharmaceutical, charities, research funders, professional and learned societies. UAR is delighted that Colin Blakemore was awarded a knighthood in the Queens Birthday Honours. Sir Colin was recognized ‘for services to scientific research, policy and outreach’. Sir Colin was instrumental in the creation of UAR. He chaired the councils of both the Research Defence Society and the Coalition for Medical Progress as they fused to become UAR and then chaired UAR’s council in its first year. We have many values in common with Sense About Science and are therefore proud to be part of their Ask for Evidence campaign. Colin Blakemore must be delighted that The Vegan Society is now involved with groups that promote his views. This is absolutely shocking on many, many levels. I can understand that The Vegan Society wants to be an “evidence-based” group. They should be. But I am completely bewildered as to why The Vegan Society would formally join any campaign with a group that so shamelessly promotes pro-vivisection propaganda, much less be “proud” to do so. Putting aside the scientific controversy about the efficacy of vivisection, vivisection cannot be morally justified despite any efficacy. As my past posts have made clear, there is a great deal about The Vegan Society that bewilders and deeply troubles me, not the least of which is that they have explicitly rejected veganism as a moral baseline. So I suppose that its partnership with pro-vivisection PR groups should not surprise me. The one thing that is crystal clear: Donald Watson, who founded The Vegan Society in 1944, would not recognize what now bears that once magnificent name. The Vegan Society responded to a complaint about this by claiming that The Vegan Society is “confronting” vivisectors. And that’s “confronting” vivisectors? For those who think this is anything but nonsense, let me sell you the Brooklyn Bridge!